In high school, while riding with a friend we drove by that house and I mentioned how much I loved it and how I dreamed of owning it. Before I continue, I should mention that as a teen I was a bit embarrassed about living in a manufactured home, even though we lived in a very nice double wide, and my closest friends knew it. I didn’t take kindly to being associated with ‘trailer trash’ and even though I don’t think anyone ever called me that, I was still scared of being labeled with such a derogatory term. I probably learned a very important lesson that day though I can’t tell you exactly what it was. Maybe that was the day I learned that manufactured homes are what you make of them. Or, maybe I learned that I was destined to live in a manufactured home and I was absolutely okay with that. Maybe I didn’t learn anything at all but should have. The very true story above came about because I wanted to share a video with you that shows how a double wide can be placed over a high foundation and turned into a beautiful home. Basically, you get the site-built look at a manufactured home price! While the video states the home is a modular, the same can be done to a manufactured home. There are a few differences between manufactured and modular. While both types of homes are built in sections in a factory and transported to the lot for assembly, a modular home must pass local and state codes whereas a manufactured home only needs to pass a national code. A manufactured home is only limited by the restrictions we put on them. 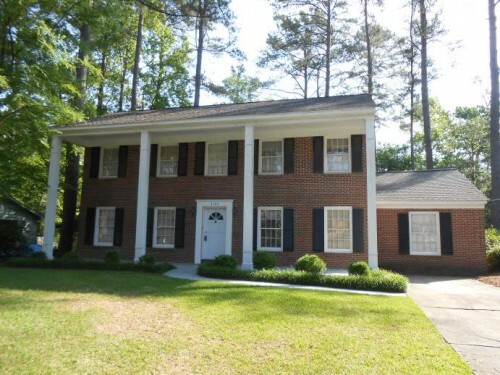 Manufactured homes can be turned into a two-story brick house with fancy white columns if that’s what you want! They can become huge ranch houses or small southwestern abodes. The sky is the limit and that’s one of the most beautiful things about factory-built homes; they allow us the freedom and the unlimited potential of a site-built home, at a fraction of the cost. Placing a manufactured home over a full basement is just one of many options for manufactured homes. I was looking at doing the same thing. I bid to purchase a home in Mineral County, WV but didn’t get it. It said the home build date was 1950 which might pre-date the manufactured home industry but I could swear it was a double-wide on a raised foundation. My backup plan is to get the land I want and then do precisely that; a raised foundation on a sloping lot allowing for basement/garage access and affix a double-wide on top of it. Not sure what part of WV you are in but maybe the people you know might do work in my neck of the woods. Great to hear from you! I’m from Pineville, in southern WV (south of Beckley, north of Princeton, east of Logan). We always joked that northern WV was ‘the rich part’ of the state. I don’t know a soul up there unfortunately. The home you looked at was likely a single wide with additions or maybe a concept home. Single wides were very popular before 1950 but double wides were not. There were concept double wide homes but it was the late 50’s – mid-60’s before double wides became ‘available’ (for lack of a better word). Hope you the best in finding the right home! Any idea of what it would cost to add a poured basement to an existing double wide? Construction and labor costs are so varied across the nation that it’s near impossible to estimate. Basements for a new manufactured home installation is labor intensive and requires specialty equipment. If I had to guess, I’d say it would cost $30k or more for a new double wide to be placed over a full basement here in WV (we have rock though). It would be even more expensive on a home that has already been installed.